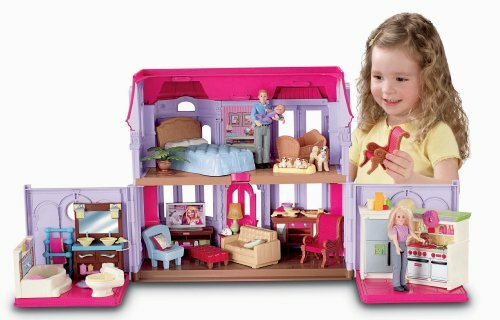 Fisher-Price Loving Family – Family ManorLittle girls love to play pretend—especially when it involves a beautiful pink and purple manor. This lovely home will encourage your child to stretch her imagination with four rooms to fill with love and family members. She can act out family routines she sees every day at home, or dream up her own! For girls ages 3 and up. She will love the extra-large rooms and fold-out floorplan! You will love how easily it folds up for quick storage! Dollhouse play is all about inspiring curiosity while having lots of fun. With extra-large rooms, and easy access to all of them, there’s plenty of opportunity for exploration and discovery. Will Mom and Dad let the baby stay up late tonight, or will they put her to bed early? Your little girl decides! She’s learning self expression, and you’re learning more and more about her each time you play together. Role playing and creativity help grow the imagination! The Loving Family – Family Manor is just the right size for a play date. With fold-out sides, there’s plenty of room to share with a friend. They can each take turns being Mom, Dad or baby. Help inspire their play, by prompting with story ideas. You’ll be helping them develop their attention spans as they respond to your ideas, or come up with their own! Before you know it, they’ll be off on a wildly imaginative ride, asking questions and having a blast! Come home to the prettiest house on the block! Every detail has been thought out with great care on both floors with extendable play areas on the ground level. When the play is done, the design of the house makes it easy to fold up and store everything inside. Don’t forget to look for more special accessories in the Loving Family™ dollhouse collection. Customized play pieces make furnishing, updating, and decorating the house an exciting activity to share with your little girl (additional accessories sold separately). Family Manor dollhouse with three figures: Mom, Dad, and baby. Realistic styling adds to the fun and expands the imagination!